Part history, part philosophy, part yoga instruction manual, this book clears up some of the confusion and misconceptions about the development of yoga, both traditional and modern. Richard Rosen draws from ancient yoga manuals, which combine philosophy with postures and meditations, to show how traditional practice compares with what we do today. He is an engaging, experienced guide who reveals the development of modern yoga through the centuries and shows how the ancient yogis did it. 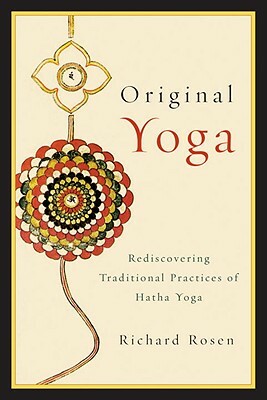 Each section offers a guided practice session of ancient poses and breathing techniques to enable readers to connect to the roots of their yoga and to provide a framework for understanding the sequences they use in their regular sessions. Richard Rosen is a graduate of the Iyengar Institute of San Francisco and has been teaching yoga since 1987. He is a contributing editor at Yoga Journal magazine and director of and one of the principal teachers at the Piedmont Yoga Studio (cofounded by Rodney Yee), in Oakland, California. Many of Rosen’s practice instructions and technical teachings are posted on the Piedmont Yoga Studio website, www.piedmontyoga.com.